Summer time is finally here, and that means many of our favorite fruits are finally in season. Watermelon is arguably the most popular melon, where cantaloupe is often forgotten about. Cantaloupes aren’t as nutrient dense as other fruits like berries, but they definitely do contain powerful antioxidants and nutrients of their own which can benefit our health in many ways. Cantaloupes are a nutrient dense food, containing all of these nutrients but only coming at a cost of 60 calories per serving. One problem people face during the summer is being at all of these barbeques surrounded by all of that tasty food high in fat and high calories. 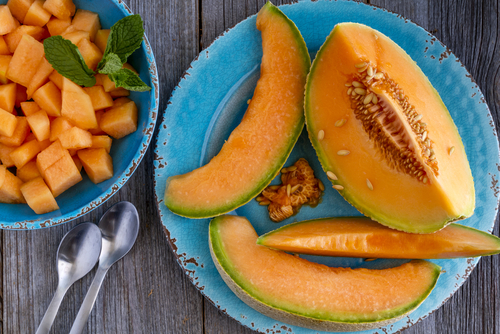 Offset all of those hamburgers and hotdogs you will be eating this summer with having some cantaloupe for dessert. It will provide you with the nutrients you need along with the hydration, which will help fight that indigestion also. 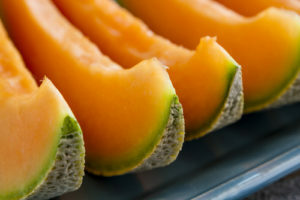 Conversely if you are on a low calorie diet, cantaloupe is a great food for you also. 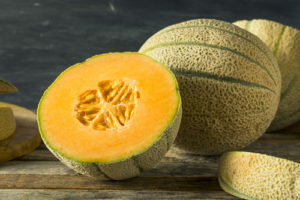 Many people who are on diets tend to become somewhat nutrient deficient through all of the calories they are cutting from their diets, and cantaloupe is a great supplement. Our blood likes to be at a slightly alkaline pH to function, which is slightly above neutral at about 7.3 or so. This is because most of the chemical processes in our body work ideally in this environment, and in this state we are able to maintain the best health. Certain foods we eat, including cantaloupes, can help us to maintain these alkaline levels in the blood. Having blood that is slightly alkaline can help us reduce the instance of inflammation as well, and is believed to be essential in fighting off other disease as well. It is also important to know that acidic foods don’t necessarily turn your blood acidic, in that the acidic here has more to do with the chemical reactions going on than the taste itself. This means that foods like lemons and limes which are really acidic won’t necessarily turn your blood acidic, and in this care are actually good for blood pH. Like many other brightly orange, red and yellow colored foods, cantaloupes contain cartenoids. These cartenoids can help protect our skin, and reduce the risk of developing skin cancer. These foods are not only effective in fighting cancer but provide other benefits to the skin as well. These compounds also help to slow aging by reducing wrinkles and discoloration of the skin. They also help to repair the damage done if you get a sunburn, so make sure to be eating more of this fruit. Cantaloupe is the most rich in vitamin A and vitamin C, providing more than 100% of what we need daily for both of these essential vitamins. Both vitamin A and C along with beta carotene are important in maintaining the health of our eyes, and cantaloupe provides all three. Research shows that a deficiency can lead to blindness of the eye in two ways. First, in that the cornea of the eye may thicken as result of a deficiency, or that deficiency can lead to the eye becoming misshapen, otherwise known as glaucoma. Last and certainly not least, as mentioned earlier cantaloupe is nutrient dense and contains a lot of antioxidants. Antioxidants provide a number of health benefits, and are generally why fruits and other foods high in these nutrients are considered to be so healthy. They are so important because they fight against oxidative stress within the body. If you aren’t familiar with the term, it is something that happens in every chemical reaction within the body. This means antioxidants are important in every process that the body carries out and are beneficial for our health as a whole. Antioxidants like vitamin A and vitamin C aren’t just important for fighting disease, but help maintain the health and longevity of our cells which reduces aging as well. Eating these foods will literally help you live longer as well so make sure you are eating plenty of them this summer. 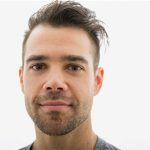 Chris, a professional supplement reviewer, who overtime has accumulated lots of experience from reviewing different male supplement products across five different continents. He has since acquired lots of laurels and awards to his name as a professional supplement reviewer all attesting to his very strong ethos of very diligent and effective reviews.